Should weak players study joseki? Newbie question: What is the advantage of knowing a joseki? is it so that you can try to force the stones into a settled position while retaining sente? or is there another advantage? Illume (25kyu): I suppose the major advantage is to recognize common continuations as early as possible. For example you might be in a position where you'd like to make life in the corner and connect two groups of stones. If you study similar positions you will know how easy or difficult it is to achieve both goals. Scartol: Go is all about patterns. Recognizing life patterns, death patterns, fuseki patterns, yose patterns. Once you are able to recognize patterns, you can consider their context in your games and adapt your play appropriately. Knowing how to use joseki is useful to me because it allows me to approach difficult situations (like the sansan invasion) without fear. I know there is a mutually beneficial way to resolve the situation, and we can proceed along the path until there's a chance to alter the pattern. Andre Engels: Basically, learning joseki is a short-cut to playing the best moves. If you know the joseki, you can then see the outcome immediately, and then quickly go through the moves until a place where either the opponent plays something different, or you prefer to do something different. Joseki contain a lot of knowledge from many players, which certainly beats having to think things out every time by oneself - some joseki sequences contain tesuji that even a top player would have a hard time thinking out behind the board. Also, when you know how the joseki goes on, you know whether it will be good to play it in a certain situation. Velobici: Joseki are based upon the best play for both players viewing the corner in isolation from the rest of the board. Therein lie two dangers for folks studying joseki. The first danger is that the joseki is the best play....meaning that both players are pushing their moves to the limit. This leaves no room for error. If the other person deviates from the joseki and you dont know why their move is wrong so that you can choose the appropriate response, they may be able to convert your previous maximum effort moves into mistakes (because you failed to support the earlier moves correctly). The second danger is that the joseki ignores the rest of the board. You can play the joseki perfectly and still get a bad result because the joseki does not support your stones on the rest of the board. A simple example is chosing the wrong 3-4 point block when another invades at the 3-3 point below your 4-4 point. 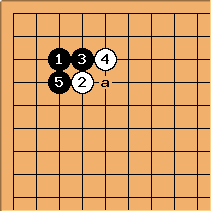 Many hamete are based upon deviating from the joseki and punishing the other players failure to push you for deviating. Dieter: I agree with the second but strongly disagree with the first. Whether or not you are consciously playing joseki, a Go player should always go for the best move he can think of. If he gets punished for it, too bad. This is not something typical of joseki. Secondly, sometimes mistakes in joseki lead to disaster, sometimes they incur a 2 point loss. The fact that people are not aware of these differences is a real danger of learning joseki. "Aha! This is not joseki ! Now I will win the game." There is also another danger of learning joseki: Joseki as a source of bad habits. BobMcGuigan: Joseki are sequences of the locally best moves but often different moves are required because of circumstances in neighboring corners or elsewhere on the board. It has often been said that joseki should not be memorized but understood move by move. Many sequences in Ishida's dictionary are no longer considered correct as a result of research and experience in pro games. If you really understand why each move is made you will be able to take advantage of mistakes and make up your own "joseki" if you don't like the standard moves. It's also worth noting that joseki "mistakes" that are considered fatal by pros might only result in a loss of one or two points, hardly likely to be fatal for most of us. Malweth: The advantage of learning joseki is to more fully understand the flow, shape, strengths, and weaknesses of the stones in the begin to mid-game. Joseki study (IMHO, of course) should concentrate on ideas and meanings behind the "best move." Commentary on Joseki is essential to this and Ishida is one of the few available (and is excellent). It won't bestow on you instant good play in the begin-game, but it will give you the ideas you need to learn on your own (through playing). 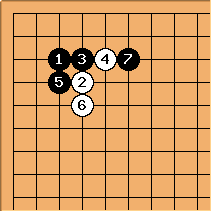 A certain level of reading is required for Joseki study and this (starting) level hovers around 3-7 kyu. Some Joseki are accessable to the "younger" (8-20k) such as the 3-3 invasion, but serious Joseki study does require good reading skills. Joseki memorization, which is often confused for "studying" or "learning" joseki, is harmful and useless. It does no good to play out a memorized sequence if you can't give reasonable responses to new variations. After some true Joseki study you will not have all the best moves, but you will be more adequately prepared to deal with bad moves (overplays) or new variations. A stronger teacher can help you when you see variations that you cannot understand. 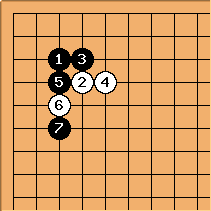 Now, apparently, the move is rather subtle, and the usual pushing battle would be to play one line higher. However, it appears that this produces weaknesses in Black's position, which might prevent a later extension from . I found this out by reading it in books, e.g., Lessons in the Fundamentals of Go, and I conjecture that most people playing either side of this joseki don't know the reason for the low posture of . Furthermore, the reason for play on the fourth line instead of between and doesn't seem clear to me at all. In fact, this move has been played against me numerous times, and I found out that it has also been tried in professional play. Therefore, the difference between it and joseki cannot be very serious. Maybe it's the possibility of a push and cut, but anyway, it is not an error, maybe simply a sub 9p move. 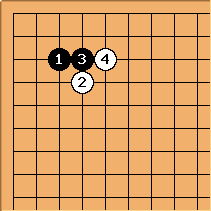 On the other hand, here is a situation where knowing joseki is very useful. Many amateur players might play , but I don't know how many would find without having seen it in a joseki book. In any case, White is in trouble. Interestingly, this seems to have an application to this non joseki move that has been played against me many times. Since is in no book that I have found, it was up to me to figure out what is wrong with it, and what to do about it. After some deep thought and knowledge of the above tactic, I concluded that maybe the best response is to play here. zinger: Surely black must cut with at a instead? The reason is that if White plays what seems to be the most natural move at , then Black gets a favourable transposition into the previous variation. Therefore my conclusion is that knowing the traps and pitfalls helps you deal with non standard plays. malweth: I agree with most of your meaning, though I don't concur with some of the terminology. 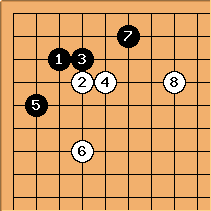 There are many different types of joseki, but all look for a settling of the stones. An invasion, a sacrifice, a peaceful or fighting joseki are possible... in all cases the goal is to make your stones strong and/or alive. Furthermore, simply playing joseki isn't the same as playing 9p quality moves. Joseki is also about board position and fuseki. Playing one joseki is often a bad move based on the rest of the board. Even taking this into account, this only gets you to maybe 3-5p. Making new moves that give you a different and better board position is where the top pro moves are found. Joseki requires a different style of reading and intuition from other parts of the game (mid-game is most similar). Studying joseki gives a good idea of what moves are possible (vital points). Once these vital points are recognized, real reading skill must come into play. Chris Hayashida: You have to be careful analyzing that way, though. For example, even though the diagram "Unfavourable transposition for White" was a bad result for White, it doesn't necessarily mean that in that diagram is the best response to . As zinger pointed out, might be better. This result would also need to be compared to other variations. 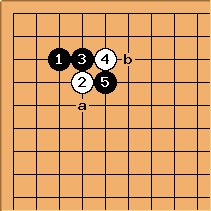 In this result, a and b are miai, capturing one of the two white stones. ilan: I believe that the words "that way" can be omitted from your text, that is: "You have to be careful analyzing." In any case, all these responses are typical of Go player discussions, which are endless debates about the minutest technical details, and which end up obscuring general conceptual points. Of course, this is simply a reflection of the type of thinking the game requires. But I strongly disagree the bias against learning (aka memorising joseki). If Go were a language, a lot of players would resemble those pupils who resist learning vocabulary by rote, because this is both dull and does not teach how to apply this words, and their more subtle meaning in context. The only way to learn that is by applying them. Without memorising you will never do that, however. Dieter: If Go were a language, yes. If Go were like bike riding, rote learning of joseki would be like steering without the bike, treading without the frame, watching a wheel from a distance ... Any analogy can be used to prove the point. I prefer to stick with the game itself. A player should indeed introduce himself to any kind of knowledge and there is no precise roadmap for that. Learning Joseki is of course good, just like learning tesuji, learning end game moves etcetera. Memorising joseki leads to people thinking that they are an inevitable building block. They are not. It's like always playing hane against the contact play. That's not what basic instinct says. If players rote memorize a joseki, chances are it is so deeply burnt into their brain, they will never deviate from the pattern and choke when an opponent does. It has a bonus effect of reducing your error margin. And if the opponent follows suit, you're both safe. That's why so many amateur games look mildly professional in the beginning, only to look crudely beginnerish in the middle game. The positional judgment and technical skill have been anesthesized by learning joseki. Anyone deferring memorization, or even proper study of joseki until he masters basic technique and tactics has a much better chance of not hitting the 9k/6k/1d roof, in my opinion. I think joseki should feel every time like you're reinventing it with a purpose, not like you're in a hurry to reach what the book calls the end position. tapir: Go isn't like bike riding :) I am very disturbed myself when I meet players who are 6 stones weaker than I am (appr. 1d EGF now), who can explain particular 3-5 joseki to me or 20k players who have particular fuseki preferences... there may be something wrong in their priorities. Particularly bad are those players who parrot the explanation given somewhere (not developing their own understanding in the process). Rote memorizing is better, simply because there is no template, no rule to stick to - you have just the moves and have to make sense out of them yourself. If you memorize a lot (as opposed to only a handful) of slightly different sequences (and contemplate about them by reconstructing games from a given position etc.) you gain much more understanding, because you get aware of and interested in these slight differences. Why exactly do I play here or there... you never start contemplating on those, if you never expose yourself to them. As my language teacher said: memorizing (ready-made dialogues) is not popular, but it works. (Not to repeat the sentences as given, but getting acquainted with the words, the structures, the flow...) Attitude matters in memorizing as elsewhere... those trying to recall the single memorized dialogue for restaurant situations when in need will be lost... while those who memorized two dozen here and another two dozen for another situation etc. will find themselves speaking fluently. Since when Tactics come before Strategy??!? RandomThoughts: Speaking from my personal experience, playing joseki improved my play even when I had no idea what their purpose was, because it gave me solid corner shapes from which I could expand, which was a clear improvement over my previous method of sprinkling stones around and see them captured one by one. I also believe that playing joseki without any deeper understanding of their purpose repeatedly is useful, if one keeps an open mind about it. By playing the same joseki repeatedly and following up on the same standard pattern in different ways one can extrapolate their purposes and their strengths, or at the least gain the necessary familiarity to follow further discussion of those joseki. When I first started playing Go, a 1-dan player in my club said that kyu-level players didn't need to study joseki. Was he right, or can weak/new players benefit from studying joseki? Bob McGuigan: It can't hurt to study joseki. The problem is that if you are a beginner, say, you won't have enough basic knowledge to understand what is going on in a joseki sequence. Probably most of us have had the experience of knowing the joseki sequence but not knowing what to do when our opponents deviate from it. A deviation from a known joseki sequence could be anything from a disastrous mistake to a fraction of a point loss to simply a different joseki. People frequently ask "How can I punish this joseki mistake by my opponent?" This is another sign that they don't really understand the joseki. Understanding joseki requires knowledge of whole-board strategy, good and bad shape, tesuji, and life-and-death. When your opponent deviates from joseki you have to use your knowledge of these things and your reading power to decide your moves. If everyone follows joseki and you know the sequence all you have to think about is whether that joseki is appropriate for the overall board position. Studying joseki even superficially can help in learning principles of shape, tesuji, and what pros consider to be essentially a 50/50 local result. It is good advice to study so that you understand the purpose of every move, but if you can only play sequences by rote you can still learn something by thinking about your moves, trying always to have a purpose and, when things don't turn out the way you expected, making an effort to understand why. BobWhoosta: My personal perspective in learning go was to play double hoshi (4-4 points) for several reasons. First, the joseki can be really simple at first, if someone approaches, you just take the opposite side in an equal manner. (This allows you to start focusing on the bigger aspects of the game, learning the strategies without too much study). Later on, as you walk the 4-4 road, you start to learn the difference between territory and influence, and the exchange of those two properties. In 4-4 joseki, the approaching play can ALMOST ALWAYS come back later and take away your corner- that is, you really don't have territory in the corner without TWO followup moves- so I started to see my "territory" disappearing, and cried frequently at this stage of my development. It was then I started to see the benefits of influence, thickness, and the attack. And thus my real reason for recommending double 4-4 opening play for beginners is this: It forces you to learn to use influence, or you will lose your games. There is a "proverb": 15 points in the corner is 15 points in the corner, you only need protect it. But a ponnuki is worth more to Go Seigen than to me, and a 30k might just let it die!!! I guess all of that to say this: "Studying" joseki means placing them in a whole board context as quickly as you can. Without this knowledge, joseki are less than useless, they are detrimental to good Go, and will harm your play for a very long time. So BE CAREFUL!!! tapir: Incidentally the handicap stones are placed on the star points - for exactly this reason. To be used in fighting.